NOTE: This web page is out of date. Please see Information Technology Services' Quick Connect guides for information on how to connect to MUN's @Memorial wireless network using Ubuntu. 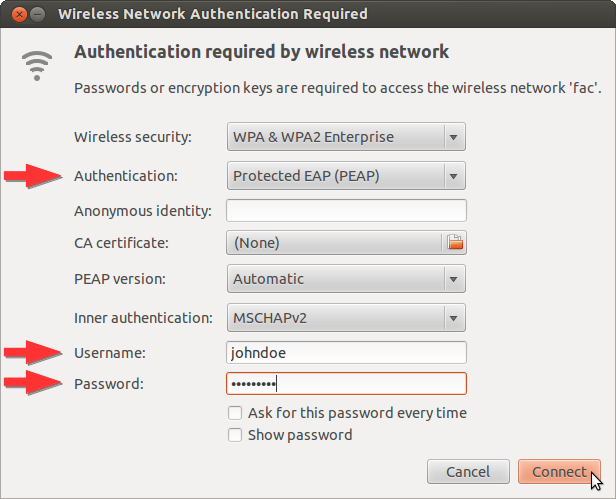 This page describes how to connect to MUN's wireless network using Ubuntu v12.04 (Precise Pangolin). These instructions may also work with recent Linux distributions that use the NetworkManager applet for network connections. Ubuntu Desktop Edition can be downloaded for free from the Download Ubuntu Desktop page. MUN's Computer Science department also mirrors this version of Ubuntu (download ubuntu-12.04.3-desktop-i386.iso and burn it to a CD or create a USB stick using the instructions on Ubuntu's installation page). Use a different (wired) network connection to make sure your system is upto date. You can use the Update Manager program which can be run by selecting the Software Updater menu option from the System Menu in the top right corner of the desktop (click the "gear" icon). These instructions assume that your wireless card is recognized by Ubuntu. Many wireless cards today are supported by Linux without the need to manually install any special drivers; however, restricted drivers may be required in some cases. Ubuntu should give you the option of enabling these drivers after installation, if necessary. To determine what wireless card you have and to see if it is supported, check out the Ubuntu Community Documentation. If your card is not recognized, check out some of the resources at the bottom of this page. These instructions also assume that you have registered with C&C's Device Authorization Tool (DAT) and that you have an appropriate login name and password for authentication purposes. 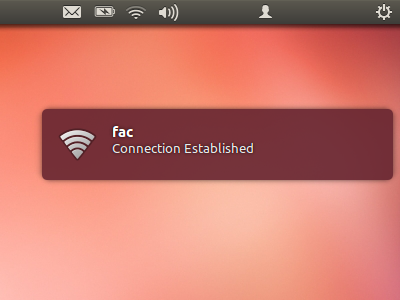 Remember the network name assigned to you (e.g., stu, fac or guest). 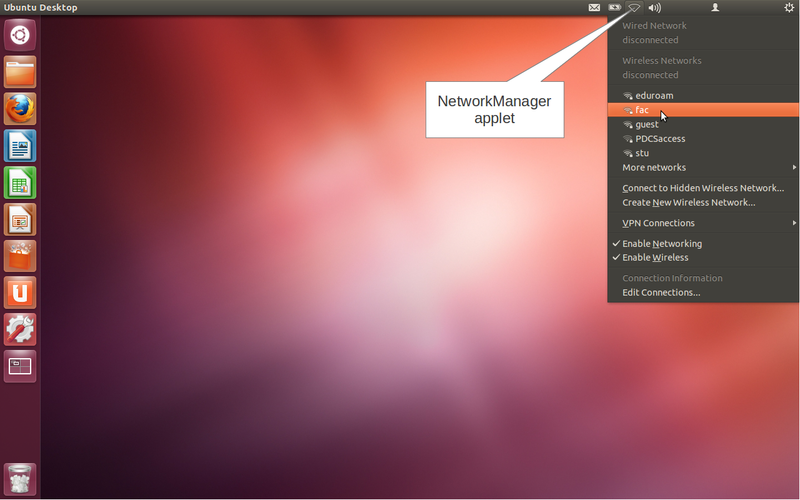 To access the wireless network configuration menu, click on the NetworkManager applet in the notification area. By default, the NetworkManager applet is typically to the right of the battery indicator in the upper right part of the desktop. When the computer is not connected to a network, the applet displays the outline of a "pie slice"-shaped icon (don't confuse it with the volume control applet to the right). Click on the name of the network assigned to you by the DAT. For the Authentication: field, select Protected EAP (PEAP) from the pull-down list. The dialog box will expand, revealing Username: and Password fields. Enter the username assigned to you by C&C's DAT in the Username: field. Enter the password that you selected using the DAT in the Password: field. After entering all the information, press the Connect button. A warning dialog box may be displayed indicating that no certificate has been chosen. Click the Ignore button to continue with the connection. An attempt will be made to connect with a wireless access point and the NetworkManager applet icon will animate. The connection may take several seconds — be patient. If the authentication succeeded, a message will be displayed and the strength of the signal will be represented graphically by the NetworkManager icon. If the connection is not successful, try repeating the steps above, making sure you use the correct network, username and password. If you are still having problems, try some of the troubleshooting guides in the Resources section below, for help.